Stocks that pay dividends typically do so each quarter. There are also companies that pay dividends annually, or semi-annually. Less common are stocks that pay dividends each month. However, there is a distinct benefit to receiving dividends every month. Monthly dividend stocks allow their shareholders to compound their wealth even faster than companies with quarterly or annual payouts. But not all monthly dividend stocks are created equal—investors should perform the same rigorous due diligence as they normally would. One monthly dividend stock that stands out as an attractive buy for income investors, is Realty Income (O). Realty Income actually calls itself “The Monthly Dividend Company.” It takes its monthly dividend very seriously, and it has the track record and fundamental strength to back it up. This article will discuss why Realty Income is my favorite monthly dividend stock. Realty Income is a Real Estate Investment Trust—or REIT—which owns real estate properties and leases them to a variety of tenants. REITs generate cash flow from rental income, which is then passed on to shareholders, through dividends. REITs maintain their high dividend payouts in large part because they are required to distribute 90% of their taxable income to shareholders annually, in the form of dividends. In return, REITs typically do not pay corporate taxes. Realty Income owns a portfolio of more than 5,300 properties, over 80% of which are retail tenants. The company is structured as a ‘triple-net’ REITs, which means tenants are responsible for operating expenses like taxes, maintenance, and insurance, in addition to their monthly rent. Triple-net leases reduces Realty Income’s exposure to rising property operating expenses, and it also provides reliable cash flow. Realty Income’s tenants include dollar stores, pharmacies, movie theaters, and fitness clubs. On 5/8/18 the company reported first-quarter financial results. Occupancy was 98.6% in the first-quarter, the highest quarterly occupancy rate in the last 10 years. Revenue increased 6.8% for the quarter, driven by higher occupancy and property acquisitions. Adjusted funds from operation (AFFO) increased 3.9% from the same quarter a year ago. Realty Income has shown the ability to continue growing, even in difficult operating environments. Retail real estate is a challenging industry right now, due to the pressure on brick-and-mortar retailers from e-commerce retailers like Amazon (AMZN). Realty Income’s focus on high-quality tenants with business models that can compete with e-commerce competition should allow the company to continue growing in the years ahead. Realty Income’s two biggest growth catalysts going forward are new property acquisitions and rent increases. The company has a disciplined acquisition strategy. It focuses strictly on acquiring high-quality properties. In the retail portion of its property portfolio, Realty Income looks for tenants that offer a service that sees demand in all economic cycles. Furthermore, Realty Income looks for tenants that are differentiated, and less vulnerable to e-commerce competition. For non-retail properties, Realty Income focuses on primarily industrial and distribution properties leased to Fortune 1000, investment-grade rated companies. Rent increases are a separate driver of FFO growth. Realty Income focuses on long-term leases, typically 10+ years, with built-in rent increases. Historically, rent increases built into leases have historically provided same store rental revenue increases up to 2% every year for Realty Income. One potential risk for Realty Income moving forward, is rising interest rates. This could be a challenge for companies that rely heavily on external sources of financing, such as REITs. Fortunately, Realty Income performed exceptionally well during the last rising-rate environment. From 2003 through 2006, the last rising-rate cycle, Realty Income grew FFO-per-share by 8.1% per year. Its dividends also continued to grow from 2003 to 2006, by 5% annually. This shows that the company has a strong business model that is built to thrive through all economic cycles. In addition, Realty Income’s strong financial position will help as interest rates climb. Approximately 91% of the company’s debt is fixed-rate, which will reduce the impact of rising rates. It also has a credit rating of BBB+ from Standard & Poor’s, which is solidly investment-grade and a fairly high rating for a REIT. Its debt-to-EBITDA ratio is 5.2, which is in-line with its peer group. Realty Income management forecasts adjusted FFO per share in a range of $3.14 to $3.20 for 2018. At the midpoint of guidance, the stock currently trades for a price-to-FFO ratio of 17.5, which is slightly above its 10-year average ratio of 17.3. Assuming a price-to-FFO ratio of 17.0 over the next five years, the stock would experience a slightly negative return of 0.6% per year from valuation compression. However, Realty Income can generate positive returns through its FFO growth and its attractive dividend. It is reasonable to expect Realty Income to grow FFO-per-share by 5% per year over the next five years, which is roughly in-line with its historical growth rate. In addition, Realty Income has a high dividend yield of 4.8%, which is more than twice the average dividend yield of the S&P 500 Index. And, Realty Income is an excellent dividend growth stock. The company has increased its monthly dividend 97 times since its initial public offering in 1994. It has increased its dividend by approximately 4.7% per year in that time. Looking back even further, Realty Income has made 576 consecutive monthly dividend payments, and paid over $5.5 billion in dividends to shareholders over the course of the company’s 49-year operating history. Investing in retail is a difficult proposition these days. The threat of e-commerce retail continuing to take market share from physical retailers is a constant overhang on the retail REIT industry. However, there are still pockets of growth in retail. Investors need to focus on the highest-quality retailers, that offer a product or service that people will still leave the house to obtain. 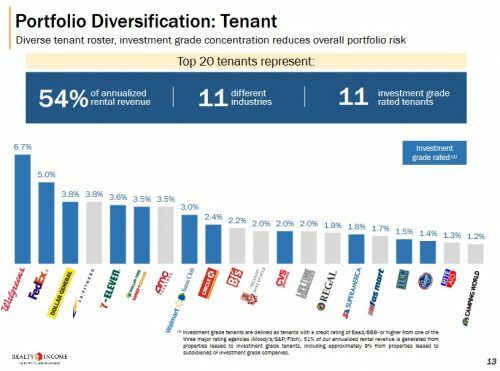 Realty Income’s portfolio is built to last, even with pressure from Internet retail. Through property acquisitions and price increases, the company should continue generating enough growth to pay its hefty 4.7% dividend yield, and also raise the dividend each year. Because of this, Realty Income is my favorite monthly dividend stock.